Examples of stretch fabrics might be Lycra, knits, jerseys, stretch satin, stretch poplin, even something that is not cut on the direction of the thread, especially something bias cut. Wondering how not to make stretchy fabric stretch beyond belief, yet still keep the seam stretchy enough so that it does not break, when the fabric stretches? Well here are some tips from what I have read and been practicing, just some secrets of the trade. You can avoid wavy seams on stretch fabrics by sewing through a layer of iron on water soluble stabilizer applied over the seam line. Or you can sew through thin tissue paper the you can then rip out of the seam. Or you can use starch (flour and water solution that you spray on), let it dry and that will stabilize the fabric, but test it first on a scrap piece to make sure you do not stain the fabric. Another trick is to glue on adhesive tape on the exterior edge of the fabric, and then stitch next to the band, towards the interior. The extra taped edge can be then cut away. 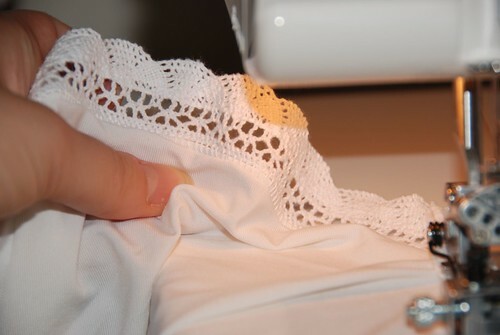 Consult your sewing machine manual for indications about what needle to choose for the right fabric. Knits and jerseys require a ball point needle, that is not very sharp, but blunt and it will not cut the weave of the fabric, but push the threads aside when piercing the fabric. A ball point needle will avoid those loose running fraying stitches in jerseys. The stitch you choose for stretch fabrics needs to stretch with the fabric without breaking. Most often I serge the edges without needing an additional re-enforcement stitch, simply by serging both seam allowances together. This gives clothes a store both look on the inside. In case I want narrow seams on the inside, for stretch jerseys or even for transparent fabrics in general the G setting on my Singer is my favorite. I like it because it uses just 3 threads so it is more economic. These are the stitches I use most on my serger for sewing sides and setting in armholes, etc…for the basic steps in garment construction. The singer offers 3 kinds of coverstitch: narrow, wide and triple. I like the narrow coverstitch for thin jerseys, the wide for knits. The triple cover stitch would look great on any fabric, even with different colors for the threads, but I use it rarely, because it is harder to take the fabric out or the machine once you finish the seam. 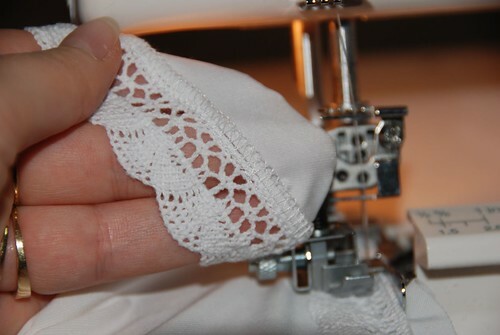 There are sergers out there that do not have coverstitches built in, as there are coverstitch machines that only do hems. You can use a flatlock stitch on your serger to simulate a coverstitch, only you will not have two parallel lines, but many parallel vertical stitches on the right side of the fabric and a safety stitch on the back that will prevent the fabric from fraying. I think the result on the right side is called a ladder stitch. Other models might have a blind stitch and that can be used with stretch fabrics just as well for hems. 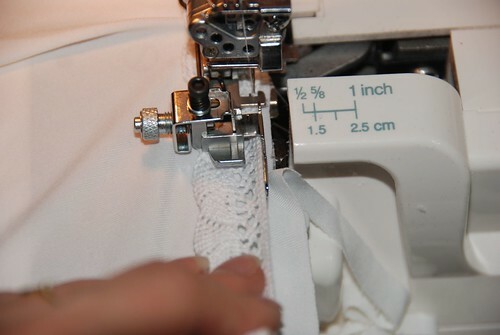 There is also a blind stitch foot as an attachment to the machine; it helps you guide the fabric while sewing. For ruffled edges salad like finishes on stretch fabrics, pull the fabric on the back and front a little to stretch it (don’t over do it, just tension it a little). Choose a rolled hem on a serger and use nice decorative threads. With a serger that has differential feed, you can play with the feed dogs to gather or stretch the fabric while sewing. The Brother 1034D serger’s user manual link below explains this very well. There are two rows of feed dogs on the serger, one in front, one in the back. If they both feed the fabric equally that is normal sewing. The feed ratio is 1.0 for normal sewing. With a low feed ratio, like 0.7 to 1.0, the main feed, the read feed dogs pull harder then the front dogs, the material is pulled tight. This prevents thin materials from puckering. With a higher feed radio, between 1.0 and 2.0, the differential feed (front) pulls harder then the rear feed dogs, the material is gathered or pushed together. This prevents stretch materials from stretching or puckering. So to produce a salad like edge, choose the lower feed ratio, to prevent a salad like looking edge, choose a higher feed ratio. Look for machine and serger manuals, they have a bunch of examples that can inspire you. For more examples on using these stitches have a look at the Brother serger, once you get familiar with your machine, you can achieve similar results, all you have to do is choose the right tension threads and thread the right needles/loopers J Lol that sounds easy, right?! While a serger is great to have and surely speeds things up, not having one should not stop you from sewing stretch jerseys. You need to play with the stitches on your machine, test them first on scraps and adjust the thread tension and stitch length/width. The zig zag stitch for stretch fabrics should be used instead of a straight simple stitch that would break when you stretch the fabric. Some machines have a triple step straight stitch that works great with some fabrics, but can sometimes stretch them too much and produce wavy seams. Choose a longer step if this happens and try again. For a zig zag choose: ½-2mm wide and 3-4mm long stitches. For finishing edges of seam allowances some home sewing machines offer overlock like stitches, if these are not available then use the wide zig zag stitch instead, with steps’ length above 1.5mm. The sorter the length of the stitch, the more the fabric will stretch, salad like looking…test it before and compromise between the fraying and the stretch. The needle should pierce the fabric towards the interior, and it should step off the fabric on the outer side of the fabric. You can also sew a zig zag and then cut the allowance off, just be careful not to cut the seam itself. Using a double needle or a twin needle, the hems can be done while maintaining the elasticity of the seam. On the right side of the fabric two straight parallel stitches will appear, while on the wrong side, a zig zag stitch will also re-enforce the raw edge of the folded hem. The zig zag on the back is responsible for the stretchiness of this seam. A salad looking like edge can be created on stretch or bias fabrics with a narrow zig zag stitch with short stitches, using a decorative shiny thread, like rayon, and holding the fabric to stretch it while sewing. You can create a fold into the fabric and sew over the fold’s edge, then cut off the excess allowance off. I like to sew from the wrong side of the fabric, with the decorative thread in the bobbin, and hold the raw edge of the fabric upwards guided through the machine feet, so that the edge is in the middle of the zig zag and the sewing thread covers it. This way I don’t have to cut off any excess fabric. I love fold over elastic tapes that capture the raw edge of the fabric in the middle, they are a great way to add shine and finish the edges with a professional look. Same stitches can be applied to the folded elastic: double straight stitch, or a zig zag or a twin needle/cover stitch. Some fabrics allow you to leave the edges unfinished as they are, pull on the fabric to check for fraying first. Are you still reading this? If so, do you feel ready to get your hands on some knits?